San Francisco, USA – Dec 3 2018: Cryptyk Inc., which is launching its decentralized cloud storage and cyber-security platform via the CTK Token Sale, announced today the completion of the private pre-sale round of its utility token offering. Aprroximately 175 million Cryptyk Tokens (CTK) have been purchased by pre-sale investors in USD, BTC, ETH and several other digital currencies. In total, the equivalent of US$11.5 million* of CTK tokens have been purchased by pre-sale round participants. Cryptyk CEO Dr. Adam Weigold commented that “selling 70% of CTK tokens reserved for investors during the pre-sale round is a great result given the very challenging crypto market climate over the past 6 months. Although it has taken longer to reach this stage than initially envisaged, the hard work of the global Cryptyk team across the US, Asia, Australia and Europe has delivered another important funding and development milestone. The company has now raised sufficient funds to complete the development of its VAULT and SENTRY SaaS products for launch by mid-2019. Furthermore, we believe the crypto-currency bear market has somewhat stabilzed and will soon reach an inflection point. Now is the ideal time to launch the CTK public sale for the broader deployment of our security focused digital token and safe-to-hack cloud storage platform." 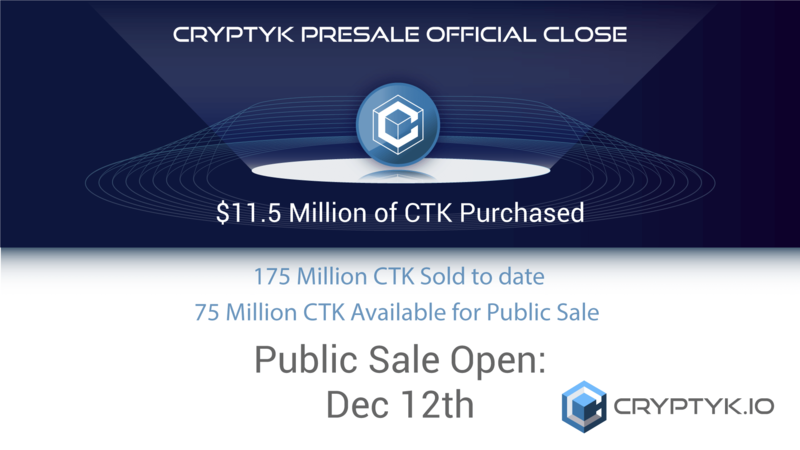 The CTK public sale round will launch on December 12 2018 and close on January 18 2019. There will be approximately 75 million CTK tokens (~30% of the total investor pool) reserved for public sale investors priced at US$0.125 per token. Minimum purchase is US$100 paybale via credit/debit card or PayPal. CTK purchases can also be made using BTC, ETH or 20 other digital currencies via the popular Shapeshift app. Purchasers of CTK in the first 48 hours of the public sale (ie: until December 14, 2018) will receive an additional 10% in early bird bonus tokens. Immediately after closing the public sale the CTK token will be listed on numerous leading crypto-exchanges including Orderbook, Kraken, Coinbene and Thinkbit. Within a month of the public sale close Cryptyk expects to be listed on at least 10 other major crypto exchanges for secondary market trading. Although the CTK token is defined as a utility token it also meets the SEC's requirements for Reg D exemption as a security. For this reason US residents are not allowed to participate in the public sale round. For more information about the public round of the CTK Token Sale see www.cryptyk.io. Cryptyk has developed a revolutionary new approach to cyber-security and cloud storage. Instead of trying to prevent data security breaches, Cryptyk assumes hacks are inevitable and makes files effectively ‘safe to hack’ while also leaving breadcrumbs on the blockchain. Cryptyk’s VAULT storage and SENTRY security platforms are based on the integration of encrypted decentralized file storage with blockchain auditing and monitoring. This hybrid solution is passively immune to external, internal, viral and operational security threats. It is the first complete cyber-security and cloud storage solution from a single vendor, and dramatically reduces the cost of cyber-security for all enterprise (most notably for banking, financial, legal and government services). The blockchain platform SENTRY is fueled by the CTK digital token that drives the Cryptyk Token economy. For more information about Cryptyk see www.cryptyk.io. * total estimate in USD is based on current exchange rates published on December 2, 2018 for BTC, ETH and several other digital currencies. Given the volatile nature of crypto-currency values this estimate may typically vary by 5-20% week-to-week.